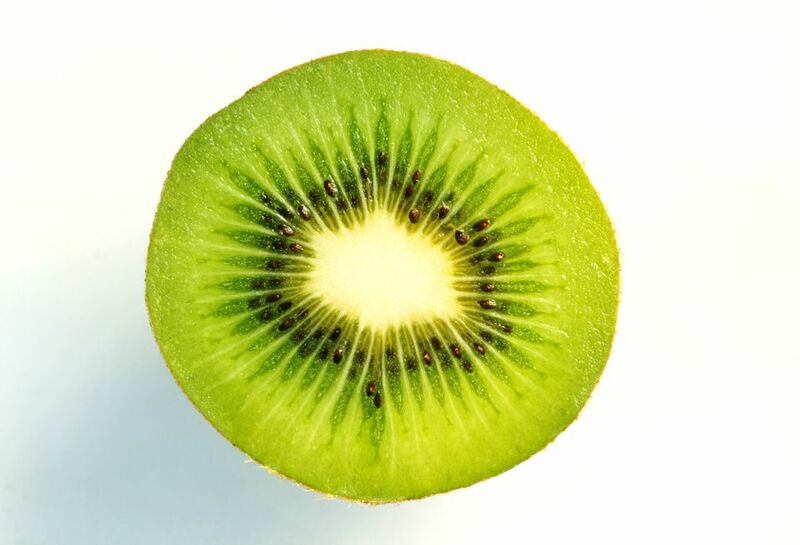 Kiwi is such a surprising fruit. How can that ugly, furry outer covering reveal a sweet/tart flesh that tastes so great? What a wonderful discovery for the first person who took the risk. If you enjoy kiwi but not the stains, learn how to remove the evidence from clothes, carpet, and upholstery. If you find a bit of kiwi dribbled down the front of a shirt, don't fear, it is easy for you to remove the stain. As with almost any type of fruit stain, the spot must be treated before the garment is washed. Heat and age are not good for fruit stains because the tannin that causes the stain becomes darker the longer it sits on fabric. Remove any solids that fall onto the surface of the fabric. Use a spoon or dull edge of a knife to lift the solids straight up. Never rub because that will drive the stain deeper into the fabrics. If it happens to be kiwi juice, blot the stain with a white cloth to absorb the moisture. As soon as possible after the stain happens, rinse the area with cold water water. This can be done by holding the stained area under a running faucet, flushing the stain from the wrong side to drive out the stain. Or, you can blot the stain with a sponge or white towel dipped in plain cold water. Treat the stained area with a solvent-based stain remover like Zout, Shout, or Spray 'n Wash. If you don't have a stain remover, use a bit of heavy-duty liquid laundry detergent (Tide or Persil have highly rated performance) to treat the stain. These detergents contain enough enzymes to break down the tannin in the stain. Work the stain remover or detergent into the kiwi stain with your fingers or a soft-bristled brush and allow it to work for at least fifteen minutes. Rinse with warm water and wash as recommended on the garment's care label. Check the stained area before tossing it into a hot dryer. The heat of the dryer can set the stain and make it much more difficult to remove. If the stain remains, mix a solution of oxygen-based bleach (brand names are: OxiClean, Tide Oxi, Nellie's All Natural Oxygen Brightener, or OXO Brite) and tepid water following package directions and submerge the garment. Allow it to soak at least four hours or overnight and then launder again. When a piece of kiwi hits a garment that is labeled as dry clean only, lift away any solids carefully. Sponge the area with a clean white cloth dipped in cool water and then blot dry. As soon as possible, head to the dryer cleaner and point out and identify the stain to your professional cleaner. When the kiwi hits the carpet, use a spatula or spoon to lift the solids away from the fibers. Don't rub because that only pushes the stain deeper in the carpet pile. When the solids are removed, blot away any moisture with a paper towel. Create a solution of two cups warm water and two tablespoons hand dishwashing detergent. Dip a sponge or soft-bristled brush into the mixture. Work from the outside edges of the kiwi stain toward the center and saturate the carpet. Blot away the moisture with a dry paper towel. Next, "rinse" the area with plain water. Use a sponge dipped in water and remove all of the soapy residue. If you skip this step, the soap can actually attract soil. Blot away excess moisture and allow the carpet to air dry away from direct heat. Vacuum to lift the carpet pile. The same cleaning solution and techniques recommended for carpet can be used to remove kiwi stains from upholstery. Take extra care not to over saturate the fabric because excess moisture can cause problems in the cushions. Allow the cleaned and rinsed area to air dry away from sunlight and direct heat. If the upholstery is vintage or expensive silk, remove the solids and contact a professional upholstery cleaneror if you need more stain removal tips.